Anyone who owns their home will be familiar with the way jobs stack. You just want to change one little thing, but before you can do that, you must move that other thing, and replace the bit there. Before you know it, fixing a light bulb has turned into replacing the drain tile. So it was with installing the paint booth. The ledge where the paint booth sits was not fastened down because the walls at either end had not yet been built. So, today, I finished one wall, and added a peg board to the other so the ledge could be cut to final length and hammered home. 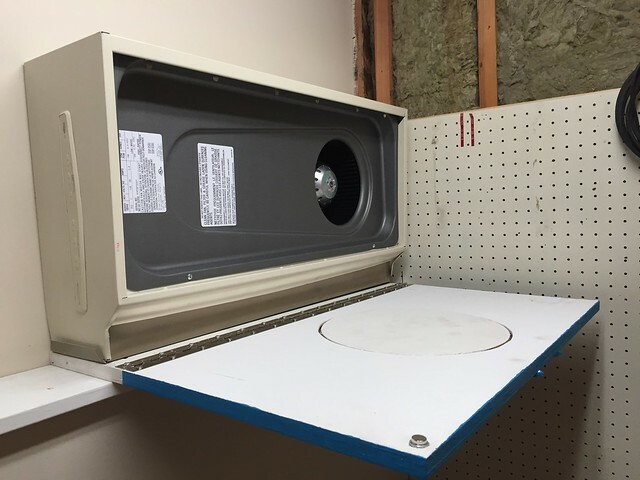 Finally, I could install the paint booth itself. That was this evening’s task, and I managed to get it done before pumpkin time for once. I’m pretty happy with the way it turned out. I even managed to get the sun’s face the right way up; that sounds trivial, but the face came incredibly close to coming out inverted. Somewhere there’s a twist, which makes the drop leaf need a second magnet to hold it up. Next Next post: A Peculiar layout?